Estate planning is often considered to be something that only the super-rich need to worry about. However, as we have shown, it covers many more aspects than trusts alone and is an important aspect of financial planning. Having an understanding of the different options available to you when it comes to deciding what happens with your assets and liabilities when you pass away, can be invaluable for those left behind. 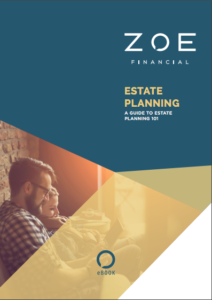 It will also give you an advantage when selecting a financial advisor with whom you will work, as you will be able to ask the right questions about their ability to connect you with right estate planning guidance. The more organized your affairs are now, the easier it will be for them to manage when you’re not around. And as we all know, the less time spent on administrative tasks at a time of losing a loved one, the better, no matter what the circumstances. We urge you to give it some thought, as unpleasant as the thought may be. Estate is the term used to describe a person’s net worth i.e. the sum of all their assets (real estate, insurance policies, business interests, trust accounts, etc.) less their liabilities (debts, overdraft, etc.). Estate planning in a legal sense is a way for someone to control their estate after their death. There are many different types of documents that can be established to indicate a person’s wishes when they are incapacitated or no longer living. We’ll go through the most common and often the most essential documents to have. A Living will is used to communicate your wishes regarding certain medical treatments whilst you are still alive. This is a very important document to have as it lets your loved ones and healthcare providers know your wishes for life-sustaining treatments (i.e. do you want to be on life support or not) in the event that you are not able to speak for yourself. A last will has specific instructions for the distribution of your estate upon death. Think of it as a document that lists who gets what if you pass away, helping to avoid any disagreements or additional emotional stress for your family. Another very important reason to have a will pertains to those who have minor children. With a will, you can name a guardian for your children in the event of your death. taking the will to court and having a judge rule that the will is legally binding. Once this happens, the assets are then distributed. If you die without a will, you won’t have any say in how your property will be distributed. Again the estate itself would have to go through the probate process and your assets would pass to your survivors according to the laws of the state. There are two main types of POAs. A medical or healthcare power of attorney designates someone to make medical decisions on your behalf in the event that you are unable to do so because a living will cannot cover every possible situation. So any decisions that are not clearly included in your Living will are made by the person to whom you have given POA. Any other POA (a “Durable POA”) is a written authorization to have someone act on your behalf as instructed in the form. A trust is a legal agreement between an asset owner and a third party (normally an individual or an institution). The agreement gives fiduciary control of an asset or an estate to a trustee, who then manages it on behalf of the owner for the beneficiaries. Trusts are used to control when beneficiaries have access to the assets, to offer protection from creditors or from the inability of the beneficiaries to manage money, and they afford privacy by not being subject to the probate process, which goes into public record. There are several different types of trusts, but the most common are revocable trusts and irrevocable trusts. or withdraw assets from the trust. You can also discontinue the trust. Furthermore, at death, the assets in a revocable trust do not go through the Last will (and therefore do not pass through probate). Instead, the assets in a revocable trust are distributed by the terms of the trust itself. This can in some cases be a much simpler process than the probate process. Often times people will create a revocable trust simply to avoid the time and costs that come with probate. That said, revocable trusts are still included in one’s gross estate and therefore they are not used to avoid estate taxes (which can be as high as 40%). An irrevocable trust, on the other hand, cannot be changed or dissolved once it has been established. This means that one cannot adjust the terms, modify beneficiaries, or remove assets from the trust once it is created. The biggest advantage of an irrevocable trust is that the assets in the trust are not included in your gross estate for estate tax purposes. Another benefit of an irrevocable trust is that the assets in the trust are out of the reach of creditors – so in the event of bankruptcy, creditors are unable to tap into the trust assets. Irrevocable trusts are generally used as an estate planning tool. If one’s gross estate and prior taxable gifts exceed 5.49 million (2017), this type of trust can save considerable amounts in estate taxes. The following are ways to avoid passing assets via the Last will, which would cause them to have to go through Probate Court and incur legal fees, in addition to the extra time it takes for the assets to arrive in the possession of those for whom they are intended. Beneficiary forms include the names of your primary and contingent (or secondary) beneficiaries i.e. the parties that receive your estate upon your death. These forms are important because a named beneficiary designation overrides the Last will, so the assets bypass the probate process. These forms are available on retirement and insurance accounts and should always be filled out. Transfer on death (TOD) and payable on death (POD) instructions function in the same way as a beneficiary designation, whereby upon death the assets automatically go to the individual(s) listed, bypassing the probate process. POD instructions are used for bank accounts such as checking accounts, savings accounts, and CDs. TOD instructions are used for securities-based assets such as stocks, bonds, and mutual funds. To set up these forms, simply ask the bank or institution where you hold these accounts and they can help you. Joint tenancy with right of survivorship (JTWROS) and tenancy by entirety (TBE) are very similar as they transfer assets directly to the surviving tenant at the death of the other. However, TBE can only be used by legally married couples and is not recognized in all states, whereas JTWROS can be used between 2 or more owners of a property, who do not need to be married. Another type of ownership is … For the rest of the guide, download it below.